It can safely be said that virtually every kid you know these days have grown up watching at least one of the six Star Wars movies, and chances are pretty good they’ve seen them all many times. Well, not everyone is going to grow up to be part of the Jedi, as these younglings aren’t too young to figure out that the Dark Side of the Force seems to hold a whole lot of promise and power. 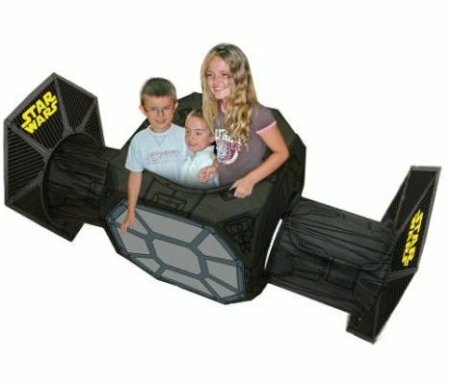 Well, here’s the TIE Fighter playhouse that ought to give your little ones plenty of fun imagining that they’re Darth Vader, shooting down Red One in the Death Star trench run. Sounds like £44.99 well spent for the upcoming summer.